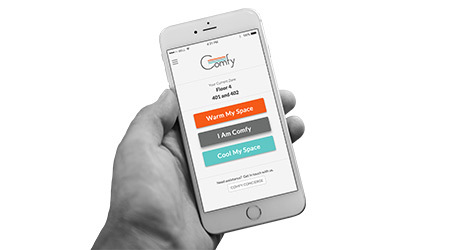 Comfy is an occupant-facing, smart building software app that delivers on-demand, personalized comfort and productivity in the workplace. Comfy turns every employee's smartphone into a "remote control for the office," by plugging into existing building systems and using machine learning to automatically tune the building based on personal patterns and preferences. Occupants use the app to select a location and make a request to instantly warm or cool the space. The system plugs into the BAS via BACnet/IP and communicates with HVAC systems. The system is subscription-based, with no upfront fixed fees. Hot/cold calls are nearly eliminated, according to the company, which says the app typically cuts HVAC energy costs.